There are certainly plenty of tasks around your Cape Cod home that make the ideal DIY projects. There are also those which are better suited for professionals. When it comes to pressure washing in Cape Cod, this is an ideal job for an industry expert but not so much for taking care of on your own. More than likely, your local home improvement store has pressure washers for you to rent. So you think that would make a great alternative to hiring a Cape Cod pressure washing company to come in and take care of the work for you. You may find out the hard way that this simply is not true. You get your hands on a rental power washer and it is high velocity. This is ideal for getting many of your exterior surfaces clean – but will you know which ones? Because if used on surfaces that this is not ideal for you can end up causing major damage. For example, you can end up causing water pockets under roof shingles which can lead to mold and rot. For a high pressure power wash, these are meant for trained and experienced pressure cleaning industry professionals. This pressure is certainly high enough to cause serious injuries. This includes having the potential to pierce skin and eyes. On the other hand, many rental units deemed “safe” for novice users lack the ability to get the level of clean that you need. Moving leaves across a driveway is about the extent of performance from low pressure washers. The bottom line is that it is a waste of your time and money to try to take care of this project on your own. To get the results that you want, and to keep yourself safe in the process, you need to let an expert get the job done. Of course, it also makes a difference which professional you choose to work with to get the job done. 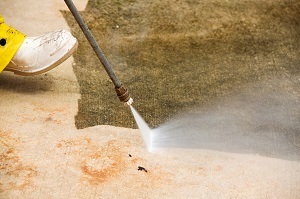 Too many so-called pros out there are not as careful with power washing as they should be. At A to Z Softwash we know when to pressure wash and when to softwash. Softwashing is the process of using gentler water pressure and cleaning agents to get the job done. This means you will end up with an expertly cleaned surface without the risk of having it damaged. It is perfect for roof cleaning in Cape Cod, which happens to be one of our specialties. If you have an exterior cleaning task, skip on renting a pressure washer, and give our professionals a call for a superior - and safe - clean.